Fans are on the edge of their seats as they patiently (but no so patiently) wait for the final season of Game of Thrones to air in April. While most of us are expecting to find out who will live or die (My money’s on Cersei definitely kicking the bucket) in Season 8, we also have been left with a ton of other questions. Like, who will sit on the Iron throne? Will Jon Snow and Danerys Targaryen end their incestuous relationship? Is Bran Stark actually the Night King? While there are a slew of unanswered questions, fans are still confused about what exactly happened to Gregor Clegane aka The Mountain? Is The Mountain a zombie? 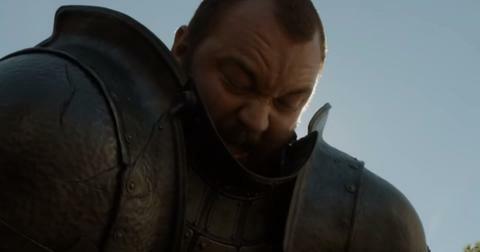 The Mountain (played by the current World's Strongest Man Thor Björnsson) is Cersei Lannister’s right hand weapon. He does whatever she tells him to do, which mostly consists of killing her enemies. Ser Gregor is shielded for the most part in battle armor, but through the small slit of his helmet we can see his red eyes and blueish-tinged skin — something that has prompted speculation he is more dead than alive. 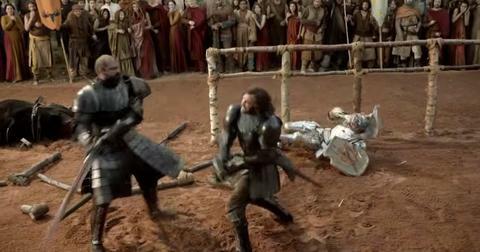 To recap The Mountain’s "transformation," during Season 4, Gregor was forced to fight Oberlyn Martell, who was seeking revenge for his sister's death. Despite being killed — The Mountain crushed his head like a grape — Oberlyn’s spear was coated in a lethal venom, which nearly killed The Mountain as well. Luckily, Queen Cersei orders Qyburn (a former maester) to do anything to save her knight. While we don’t exactly know what experiments were done on him during his time with Qyburn, we do know that it resulted in The Mountain looking more intimidating (and scary) than ever. 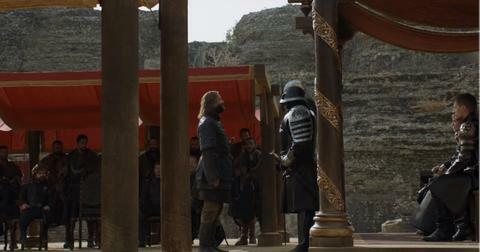 Will The Mountain and The Hound finally fight? If you’re an avid GOT’s theorist, then you definitely have come across what is known as "Cleganebowl" — the theoretical fight between Ser Gregor and Sandor Clegane, better known as The Hound. As we learned in Season 1, the Hound’s face was severely burned as a child after The Mountain held his head into the flames as payback for playing with his toy. Throughout the GOT’s series, we see the hatred the two have for one another on more than one occasion. While many thought we were going to see some action in Season 7’s episode “The Dragon and The Wolf," the writers only gave us a taste of what could potentially be a huge battle between the brothers in Season 8. “It’s not how it ends, brother,” The Hound said when he's reunited with The Mountain. "You know who’s coming for you. You’ve always known." Will The Mountain Kill Queen Cersei? While some fans think The Mountain’s sole purpose is to serve his Queen, others predict he will turn on Cersei in Season 8. 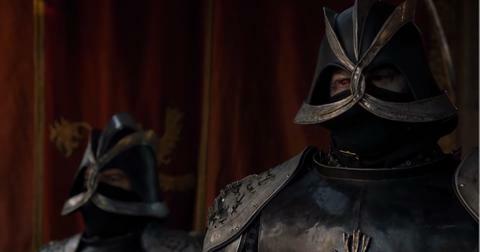 "The Mountain is not truly loyal to Cersei; he is loyal to Qyburn. Qyburn just commanded him to obey Cersei completely until he says otherwise, unless she orders The Mountain to hurt Qyburn," one reddit user theorized. "He is programmed to never harm Qyburn under any circumstances." The fan continued to explain how Cersei will order the death of Qyburn, but The Mountain will act against her and either leave her to die or kill her himself. Though it would be a shocking twist, we have a hard time believing this is how Cersei’s reign will end. Is that The Mountain chasing Arya Stark? Fans have been rewatching the GOT’s Season 8 trailer on repeat, and something that caught all of our eyes was Arya Stark frantically running down the halls with a wound on her forehead. 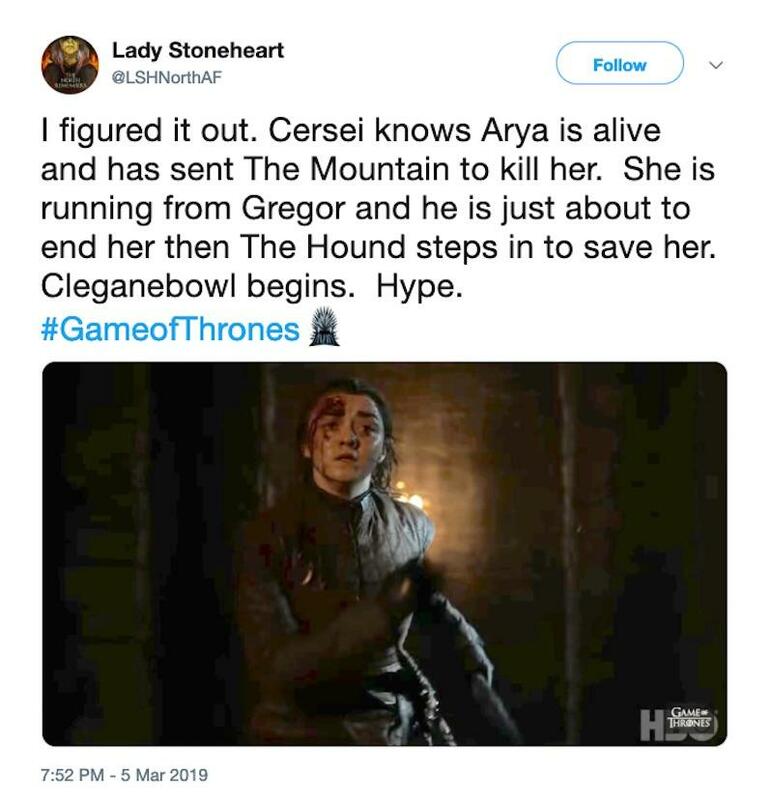 While there are numerous theories as to who, or what, is possibly chasing the Stark girl, one fan suggested The Mountain has been ordered by Cersei to kill the young wolf. “I figured it out. Cersei knows Arya is alive and has sent The Mountain to kill her. She is running from Gregor and he is just about to end her then The Hound steps in to save her. Cleganebowl begins. Hype. #GameofThrones,” a fan tweeted. When The Hound makes the statement: “You’ve always known,” one reddit user took the theory of Cleganebowl to a whole other level. This fan predicted that since The Hound is able to see visions when he stares into fire, he had one as a child. He theorized that a young Hound looked into the flames and saw a glimpse into the future — a future that has him killing his older brother. "When he told his brother what he saw, Gregor became enraged and tried to kill him with that fire. Gregor never attacked Sandor over a toy, he tried to kill him to prevent the vision from coming true,” wrote the reddit user. "So, Gregor has been rage killing ever since because he knew he was invincible to all but Sandor. Sandor has been avoiding the flames ever since not just because of the trauma of being burned, but because the visions he saw there caused everything between the brothers." The final season of Game of Thrones premieres Sunday, April 14 at 9 p.m. on HBO.